Share the post "Nyctanthes Arbor-Tristis Or Night-Flowering Jasmine – The Tree Of Heaven"
Nyctanthes arbor-tristis (Night-flowering Jasmine, Coral Jasmine) is a species of Nyctanthes, native to South Asia and Southeast Asia. It is a shrub or a small tree growing to 10 m tall, with flaky grey bark, large attractive rough and hairy leaves, and exotic highly perfumed small white flowers with an orange-red tube in the center. The tree is sometimes called the “Tree of sorrow”, because the flowers lose their brightness during daytime; the scientific name arbor-tristis also means “sad tree”. The flower is the official flower of the state of West Bengal, India, and for Kanchanaburi Province, Thailand. Night Jasmine blooms profusely, flowers are opening at night and casting off in the morning thus making a carpet of flowers, which are used in Buddhist temples, for worship. 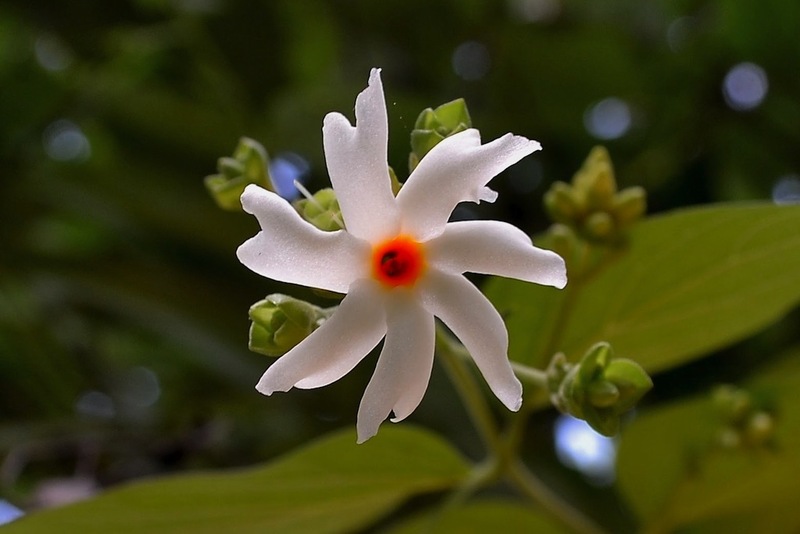 Parijat (Nyctanthes arbor-tristis), appears in several Hindu religious stories and is often related to the Kalpavriksha. According to mythology, this heavenly tree was brought to earth by Krishna. Satyabhama and Rukmini, Krishna’s wives, had a quarrel over this tree. But Krishna planted the tree in Satyabhama’s courtyard in a way that when the tree flowered, the flowers fell in Rukmini’s courtyard. Another romantic story woven around the tree is about Parijataka, a princess. She fell in love with the sun but when he deserted her she committed suicide and a tree sprung from the ashes. Unable to stand the sight of the lover who left her, the tree flowers only at night and sheds them like tear-drops before the sun rises. It is believed that Parijat (Nyctanthes arbor-tristis) is one of the five trees that exist in heaven. Nyctanthes arbor tristis is widely used in the Ayurvedic system of medicine for treatment of many ailments. • Leaves: Antibacterial, Anthelmintic, Anti-inflammatory, Hepatoprotective, Immunopotential, Anti-pyretic, Antioxidant and Anti-fungal. Parijat leaves have been used in Ayurvedic medicine and Homoeopathy for sciatica, arthritis, fevers, and as a laxative. Patients with gynecological problems are advised to take 3 fresh night jasmine leaves, with 5 black peppers. leaves are also blend into a paste and used in skin related troubles, especially ringworm. The leaf juice is mixed with common salt to treat intestinal worms. • Flowers: Diuretic, Anti-bilious, Antioxidant, Anti-inflammatory, Sedative and Anti-filarial. The decoction of night jasmine flowers is used in treating gout. • Seeds: Antibacterial, Antifungal, Immunomodulatory and Antileishmanial. The seeds are crushed and the aqueous paste is applied externally on the piles. They are also useful in treating baldness, scurvy and affections of the scalp. The decoction of its seeds is used as a hair tonic. Washing hair daily with this tonic helps to get rid of dandruff and lice. • Stem: Antipyretic and Antioxidant. • Nyctanthes arbor-tristis new leaves are fried and used as a recipe in some Assamese and Bengali cuisines. Its dried flowers are used as components of recipe in Assamese food. • The flowers can be used as a source of yellow dye for clothing. • Flower oil is used as perfume. • Use well drained soil and fertilize once a month. • Propagation is easier by seeds as cuttings are very hard to root. It is recommended scarring the seeds, soaking them for 24 hours, and then planting them in a non-soil seeding mix. You’ll probably want to give them some bottom heat and keep them in about 70 degrees. Don’t let them dry out, but no need to drown them as the soaking will have moistened the interior of the seed. • The plant needs warmth during winter months. Do you grow Nyctanthes arbor-tristis (Night-flowering Jasmine) in your garden? What is your experience with this plant? Please share with other fellow gardeners in the comments below!